I went for a bike ride around Bristol yesterday. I set off along Clifton Down, went across to Redland and then Stokes Croft, meandered through parts of the City Centre, and then made my way onto the Bristol and Bath Railway Path, coming home via Fishponds Road, Old Market and Park Row. I didn’t have any destination in mind, I was just following sign posts and whims to get a feel for how well the road system guided and protected cyclists in general. I tried hard to use cycling facilities as much as possible, and I didn’t take a map or other information with me. It’s always a pleasure to be out on a bike in good weather, so I did enjoy the experience. But if you ask me whether Bristol is a cycle-friendly city I would have to say that it falls a wee bit short of being so. I don’t want to make detailed observations of specific aspects, or offer comparisons with other places. Engineers and planners do all that for a living, and when I’m cycling I’m not that interested in the technical niceties. I’m reporting raw impressions here – the immediate feelings and experiences that would affect my willingness to evangelise for cycling as a great way to travel through and around the city. What follows is a list of the most obvious problems that cropped up, or gradually accumulated over the couple of hours that I was out and about. Long as it is, it isn’t exhaustive. Nothing persists. There are starts and beginnings in all sorts of places. Frequently during my journey a cycle lane, some cycle crossing lights, or a direction sign attracted my attention. Most of them petered out pretty quickly, some of them almost immediately. Very little seemed to be joined up or continuous. The Bristol and Bath Railway Path is the obvious exception, but finding its start without maps, trials and errors is as good as impossible. Once on it, leaving Bristol is easy enough – just keep going. But getting back into Bristol is a magical mystery tour. Visitors from Bath will find precious little help in getting to the nice bits: there is certainly no consistent, obvious and reliable signage through the wilderness once the path has been left behind. Permission to cycle is confusing. I know from careful reading of specialised maps that some parts of Bristol permit cycling in shared areas that were originally built for pedestrians. Other very similar areas are designated as non-cycling. But in neither case, on the ground, is it obvious whether cycling is permitted or not. 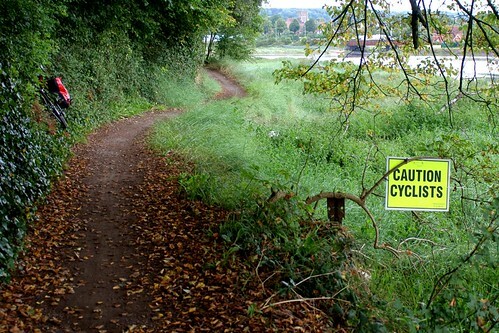 The result is that there is some cycling in almost every situation – legal or not. Those who no longer care cycle regardless of regulations. Those who would like to be legal have no way of knowing (from what they see around them) whether cycling is allowed or not. Road crossings and junctions are confusing. Some combinations of lights, dropped curbs, road surface marking and signs are bewildering (perhaps I’m just too old to cope?). The only way to avoid the confusion is to ignore them and keep a close eye on the traffic and the real hazards around you. Some cycle lanes are worse than useless. A cycle lane alongside parked cars is an invitation to take risks. I passed a couple of sections yesterday, and I know that there are others around the city. In my opinion you can have parked cars or a cycle lane, but not both. Being guided to pass within inches of parked cars on your left, while vehicle traffic passes inches to your right feels wrong. When I cycle past parked cars, I normally make sure that there is at least the width of an opened door between me and the cars. If this means taking a bigger chunk of the highway, I look behind me and then move further out from the hazard than a cycle lane normally provides for. Facilities are badly maintained. Paint on a road lasts a year or maybe two. There are plenty of lane markings and cycle symbols in Bristol that have been reduced to illegible flecks. Being early Autumn I noticed that many of the pretty and useful painted signs along the Bristol and Bath Railway Path are now obscured with mud and leaves. I had been looking so that I would know the name of my exit point. Direction signs for cyclist routes are easy to turn round,and some have been. It only takes one puzzling experience to lose confidence in all of them. Road names and confirmatory route signs are less common than I need them to be. Given that direction signs are few and far between, the help given by periodic confirmation of where I am and and where I am heading is reassuring. If you already know the way, of course, this doesn’t apply. But after a mile or so on an unknown road I like to know that I am (or are not) still heading towards City Centre, or wherever else it was that the first sign had directed me. Major roads have all this covered very well for motor vehicle traffic. Cycling, with its shorter distances and slower speeds benefits from equivalent treatment. Major roundabouts are not designed with cycling in mind. One or two large and busy roundabouts had significant problems with lane choice for cyclists. On one occasion a lane marked with my intended destination on approach to the roundabout left me in the wrong place for safe exit, requiring a move across to a different lane while on the roundabout. Not a good feeling. Roads are littered with stationary vehicles. Whatever the rules seems to say, there are always vehicles parked on double yellow lines, junctions, pavements, at bus stops and on cycle lanes. Each one, I’m sure, is only there “for a minute or two” but every stretch of road seems to have at least one, obscuring a view of the road, narrowing the carriageway or stopping traffic. Vehicles waiting right up at the cycling advanced stop line are common. However dismal all that sounds, I am still happy to keep cycling around the city. I enjoy it. The problems I found are ones I can manage and I will gradually learn to cope with or avoid the worst bits. But would I recommend, Boris Johnson style, that beginners or school children should simply ride with confidence, quick wits and the Highway Code for guidance? Cunning, intuition, experience, good balance, strong legs, quick eyesight, research, patience and a friendly guide or mentor are all needed to get the full access to all the areas that you might want. Compared with the Dutch town I spent two weeks in during the 1970s, Bristol feels more like 1870, just like all the other lovely English cities I know. General enslavement to the motor car looks as hard to escape as it ever was.